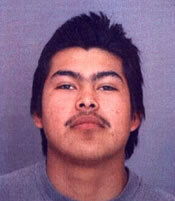 On April 12, 1997 a homicide victim was found on Highway 1, south of Lompoc. Investigation led to the issuance of a warrant charging murder and robbery to Israel Lagunas Guadarrama. Additionally, there is an Unlawful Flight to Avoid Prosecution warrant issued in Federal Court. It is believed he fled to Mexico. If you have information regarding the whereabouts of Israel Lagunas Guadarrama, notify local law enforcement authorities or contact Santa Barbara County Sheriff’s Detective Bureau.